Arrival at the Skopje International Airport. Transfer to a hotel in Skopje (20 km). Lunch in a national restaurant at Matka canyon. After that, you can visit: canyon Matka, the man made lake Treska and the cave Vrelo. An exceptional breathtaking nature, maybe the most popular natural attraction in Macedonia. We have free time for photo shooting. We are leaving Matka and we will drive for Kumanovo to accommodate in a hotel (60 km). Next sightseeing, before the sunset, is the megalithic observatory Kokino (55 km), the fourth oldest (3800 years old) and most important in the World, ranged by NASA. We will come back in Kumanovo for dinner in a local restaurant. Overnight. Breakfast at the hotel. We have option to go again to Kokino for morning photo shooting or to go directly to Kuklica (65 km). We will visit the site Kuklica (15 km), where you can see the stone dolls. We are continuing for Kratovo (15 km), a medieval town with many old towers and bridges. Lunch in a local restaurant. Next sightseeing is Stobi (115 km), the biggest ancient Macedonian city. Then we will visit Demir Kapija (30 km) and the Winery Popova Kula, and have dinner with wine tasting. Overnight. Breakfast at the hotel. 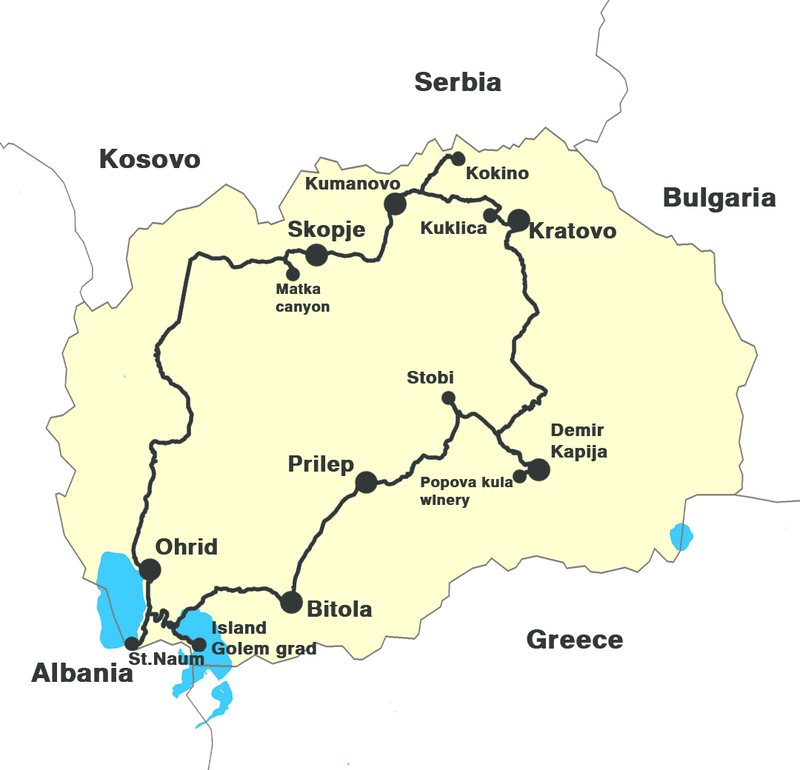 We will drive for Prilep (85 km), where we will visit Marko’s towers. Lunch in the restaurant Makedonska kukja in Prilep. After that we will go to Bitola (40 km). Here we will visit the ancient Macedonian city, Heraclea Linkestis. After that we will walk through the most famous Macedonian street – Shirok sokak. The city is known for its Turkish style bazaar, where you can buy everything from fruit and vegetables to parts for vehicles. Having this amazing atmosphere hustle and bustle, people shopping, mixture of all kinds of smells and colours-its amazing. We can be accommodated in a hotel in the center of Bitola, or we can drive a bit outside Bitola, to accommodate in the hotel Sumski Feneri on the mount Baba. Chance for strolling through the national park Pelister. Dinner at the hotel. Overnight. Breakfast at the hotel. Transfer to the Lake Prespa (65km) in the early morning. Then we get by boats to the island called Big City, in the middle of the lake. The island is a habitat for many species of birds – pelicans, cormorants, and white and gray herons. Birds found their refuge only in this desert island. From a boat you can record a phenomenal hunting pelicans, which glide over the water looking for fish. Lunch in the village Konjsko. In the afternoon we come back to Bitola (65 km), where we rest after the long day. Dinner at the hotel. Overnight. Breakfast at the hotel and check out. We will drive through the National Park Galicica and stop for photo shooting. After that we are going to the medieval monastery St Naum and the Lake Ohrid springs. In the monastery we can see the tomb of St Naum of Ohrid – student of Cyril and Methodius. According the legends, you can still hear his heartbeat. We will have lunch in the restaurant Ostrovo, St Naum and take rowing boats to the springs. The next stop is the Bay of bones or the Museum on water. Accommodation in the hotel City Palace or another one in the town. Free afternoon. Dinner in the hotel. Overnight. Breakfast at the hotel. 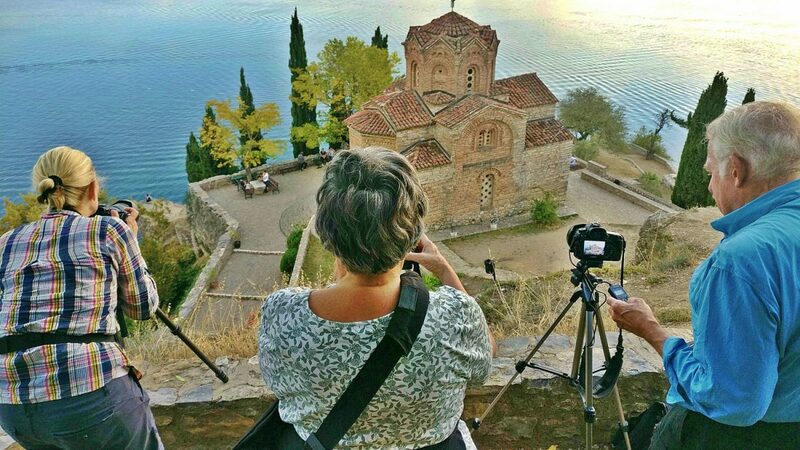 Ohrid itself is the jewel of Macedonia, the city of the most Macedonian Orthodox churches, in its narrow alleys hides history, dating back over 3.000 years. Located at the foot of the mountain Galicica on the shores of the Lake Ohrid. Both the city and the lake are inscribed on the UNESCO World Cultural and Natural Heritage list. 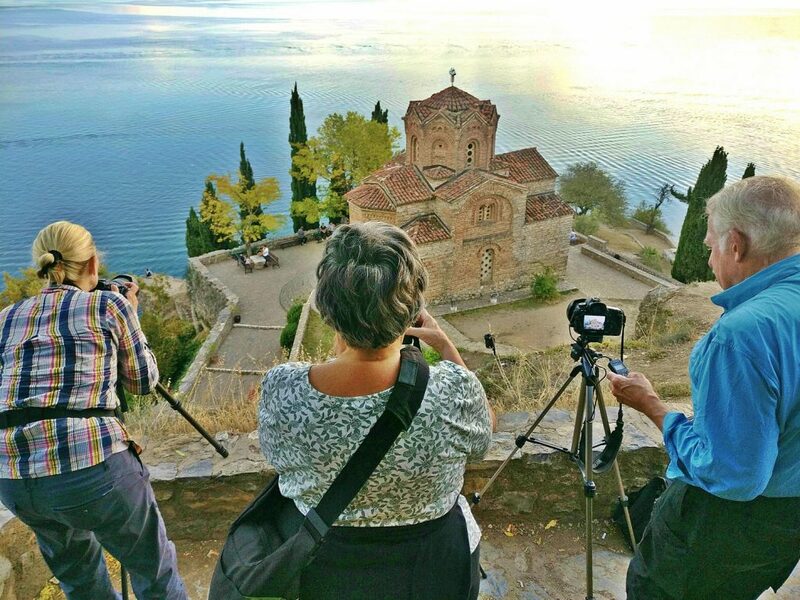 In the morning, we will walk through the streets of Ohrid to reach the highest point – Samuil’s Fortress, which offers wonderful landscapes of the whole area. Exploring the old town. Lunch in a national restaurant. Transfer to Skopje (160 km). Free afternoon in Skopje. Dinner in a restaurant. Chance for night photo shooting in the center of Skopje. Overnight. Breakfast at the hotel. You will have panoramic and walking tour and visit: Kale – Skopje fortress, The Old Turkish Bazaar, The Museum of Macedonian struggle, The Archaeological museum of Macedonia, the Stone bridge-Skopje’s landmark, the Monument and fountain of Alexander the Great and the house of Mother Teresa. Transfer from the hotel to the airport of Skopje around noon.